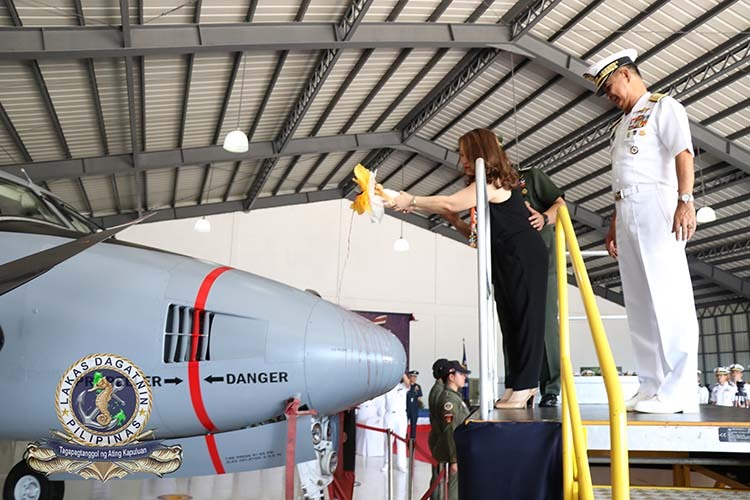 MANILA — The Naval Air Group (NAG), based in Sangley Point, Cavite City held activation and blessing ceremonies for the fourth Beechcraft King C-90 donated by the Japan Maritime Self Defense Force (JMSDF) Monday. The ceremonies took place at the NAG Hangar, Naval Base Heracleo Alano, Philippine Fleet spokesperson, Lt. Sahirul Taib said in a statement. The fourth C-90 is one of the five aircraft donated by JMSDF and will be used as additional platform for maritime air patrols. Activation and blessing ceremonies were presided by Armed Forces of the Philippines (AFP) chief-of-staff, Gen. Benjamin Madrigal Jr. and NAG commander, Captain Juario C. Marayag. Madrigal acted as the event’s guest-of-honor, while his wife Ma. Gemma served as the plane’s principal sponsor. Madrigal was awarded Honorary Command Naval Aviators Badge, a first in AFP history, and emphasizes the Navy’s continued support to the military leadership and sustained commitment to its constitutional mandate. “I believe that having these capabilities give an unparalleled advantage to our decision makers in the frontline. I cannot overemphasize maritime situational awareness as a factor in achieving archipelagic maritime security. Naval air operations have time and again proven to contribute in providing strategic and common operational picture. The range and speed of this C-90 are relatively unprecedented in the PN inventory,” Marayag said. The C-90 was offered by Japan shortly after the Agreement Concerning the Transfer of Defense Equipment and Technology was finalized in February 29, 2016. The aircraft has a range of over 1,000 nautical miles, and cruising speed of 226 knots and capable of carrying eight passengers along with the pilots.